C Squad: Together for the Journey provides a safe space where middle school youth can build relationships, address crucial issues in their lives, and develop social and emotional strengths. C Squad (formerly called CREW) is designed for middle school advisory classes and for after-school programs. It has been implemented in over a dozen NYC schools and after-school programs. In pre- and post-surveys, participants showed improvements in perseverance, academic motivation, critical thinking, assertiveness, trust, empathy, optimism, and peer and adult relationships. C Squad harnesses what the latest scientific research tells us are the optimal conditions for learning in early adolescence and reflects current findings in brain development research. Friendship, stress, standing up to discrimination, cliques, social media, bullying, gender identity, and becoming a successful student – these are some of the key adolescent issues addressed in our middle school curriculum, C Squad: Friends for the Journey. The “C” in C Squad stands for Circle. The circle format used in C Squad sessions encourages a sense of belonging and connection, enabling students to have constructive conversations about these and other challenges in their lives. The C Squad curriculum is designed for advisory classes during the school day and for afterschool and expanded day programs. The C Squad curriculum consists of 14 units, each addressing a challenging issue in the lives of young adolescents, from friendship to bullying. Social and emotional skill-building is integrated into each unit according to its usefulness in helping a young person deal well with the issue the unit is addressing. Students meet several times a week in groups of 10-15 with a C Squad leader, an adult who facilitates circle sessions of 35-45 minutes. Morningside Center provides introductory training and tailored coaching to support educators in facilitating the circles and creating an equitable and caring classroom community. 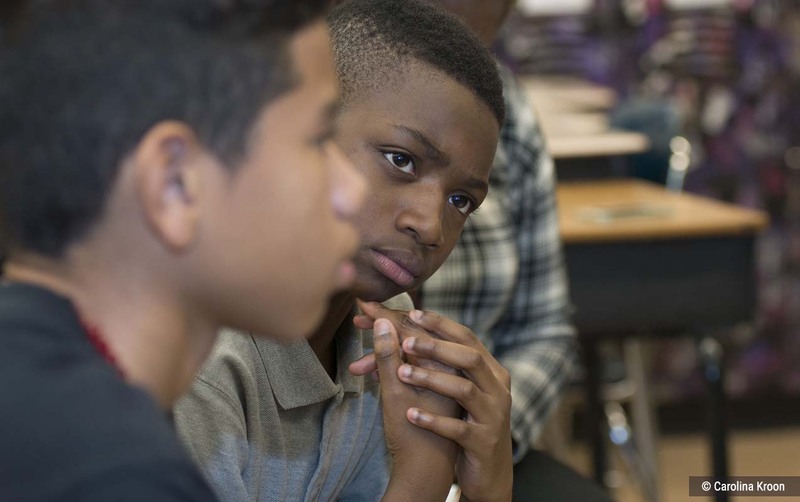 The skills and community students and adults build through C Squad can lay the groundwork for a school-wide shift to social and emotional learning (SEL) and restorative practices, leading to fewer discipline issues and a kinder school climate. Find out more about this whole-school SEL/restorative practices model, Restore360. 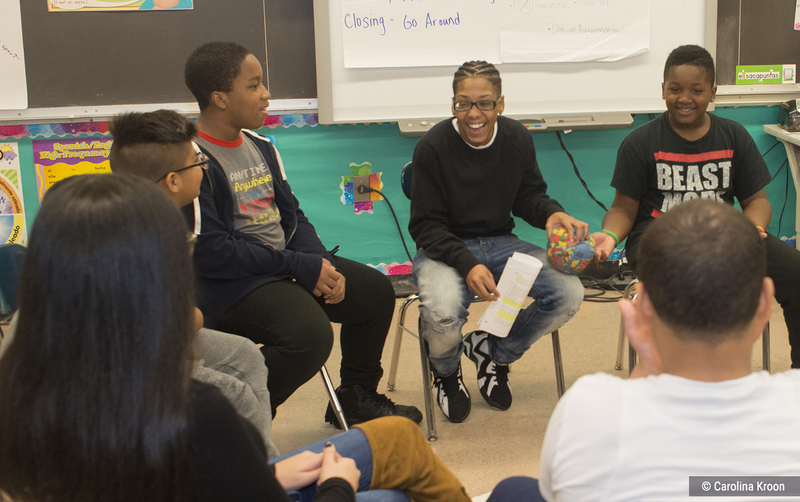 The circle approach is an excellent way to foster social and emotional learning in middle school because it directly addresses two crucial developmental needs of adolescents: belonging and having voice. Find out more about circles. The C Squad curriculum addresses key issues in the lives of young adolescents, including friendship; handling stress; standing up to discrimination; cliques, bullying, social media, and becoming a successful student. The C Squad curriculum has plenty of material for all three of the middle school years. Following several core units, teachers can choose from a variety of units depending on their students' particular needs and interests. My students offered alternatives to put-downs that were so creative and heart-warming. Students left me amazed about the maturity they showed while speaking and giving advice. A few weeks ago in Ohio, several of the teachers I was coaching raised a concern I've heard before. It's about handling student emotions in a circle. "Was it safe to raise emotional issues in a circle?" these teachers asked "After all, they weren't therapists."